Is your audience paying attention to your presentation? Unfortunately, you’re totally wrong in making that assumption about your audience engagement levels. Let me start by saying – Audience of today is very different from the audience of yesterday. In the past, when you made a presentation in the boardroom, people were willing to listen to what you have to say. They used to look at your slides, ask questions and in general used to engage with your content much better. BUT TODAY, THINGS HAVE CHANGED! Your audience is not as attentive anymore. The usual presentations just don’t excite them. Do you know why? In the past – audience had fewer distractions. Their average attention span used to be 12 minutes. So, they listened to whatever you said, even if your presentation was not well designed. But today, the audience is highly distracted. First off, every executive these days is doing the job of 3 people. That means, they are pulled in all directions all the time. They have a constant mental fatigue. To add to that – they have a million things vying for their attention all the time. They need to respond to pending emails, chase impractical deadlines, manage projects all while checking their Facebook updates, reading twitter feeds, chatting in WhatsApp and so much more. Their minds have lost the ability to focus on any one thing for a continuous period of time. Related: How well do you know Joe – that key person in your audience? In fact, a recent Microsoft study concludes that people have an attention span of less than 8 seconds today. Yes. The average attention span has dipped from 12 minutes to 8 seconds. Even a goldfish has a better attention span than that. Now, can you see why it is so difficult to get your audience to pay attention to your presentation? In fact, as a business presenter, the biggest risk you face today is not that your audience won’t understand your ideas or they would reject your ideas – the real risk is they won’t even pay attention to your presentation in the first place. How to retain your fleeting audience attention? If you want to win a business presentation today, you need to know how to master ‘Audience attention management’. You need to know how they think, so you can present your ideas in the way they naturally receive, process and decide on new information. After all, if you don’t have your audience’s attention – you don’t have anything. So, the next time you design your slides for your business presentation, don’t take your audience’s attention for granted. If you feel a twinge of doubt, get back to the drawing table. After all, once you lose your audience’s attention, it is very hard to get their attention back for the rest of your presentation. That brings us to the obvious question – how to manage your audience’s attention? Fortunately, the latest research from brain science answers that question for you. You can read about that in this article called, “The brain science behind winning Business PowerPoint Presentations”. 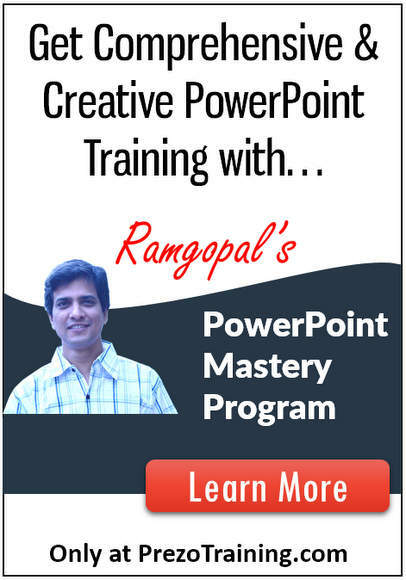 By the way, if you want to know how to create PowerPoint presentations that grab and hold your audience’s attention, I suggest you take a look at our Ramgopal’s PowerPoint Mastery Program. It is the most comprehensive and creative PowerPoint training online for business presentations. It is the only program you’ll ever need to master PowerPoint. Especially, our course on Visual Slides Mastery will help you convert your text based slides into clear and memorable visual slides in a matter of minutes using a simple 4 step process. The process is simple enough for even a beginner to create visual slides easily. At the same time, the process is created using the latest research from brain science, so you can be sure about your results. Please click on the link here to know more about our program.